No potato chips, no oreos, no bagel bites, no donuts? What will you ever do when those in-between meals hunger pains hit? First of all, you do not need to worry…not on the 21 Day Fix diet. Instead of reaching for the unhealthy stuff, you will eat healthy, whole food-based snacks that are still as tasty as the processed junk you may or may not be used to. Here are twenty-one of my favorite snacks that travel well and are all 21 Day Fix approved! Here is a list of 18 21 Day Fix diet-approved snacks to help get you started, so you never need to worry about being hungry. I hope this list of eighteen 21 Day Fix-approved snacks has given you some ideas as to what you will be able to eat between meals. The key is be a little creative when you’re eating healthy and make things that are not only good for you, but taste good, too. You can even continue to use these healthy snack ideas long after you’ve finished the 21 Day Fix to keep living a healthier lifestyle. The Fix is a whole foods diet that cuts out the nasty stuff, including processed sugar, white flour, and salt. However, this just proves you can still have foods that are full of flavor and contain the nutrients your body needs for optimal health. What are your favorite 21 Day Fix snacks? Please leave a comment below. So for the Banana Dreamsicle: almond milk is considered a yellow? (I don’t see it on my list.). How much almond milk? Put it in the yellow container? Hi! I have a super quick question for you: hemp seeds . . . which container would they be?? Thanks for your guidance! Can you eat seaweed chips?? Hi Christina, I would check the ingredient label for any hidden ingredients, but I think they would be okay. I just ordered 21 Day Fix and I’m super excited to get started! I was wondering: at our local grocery store, we have an organic section where you can grind your own peanut and almond butters, and the almond butter we purchased today lists in the ingredients only almonds – no oils or anything added. If the “butter” is literally just ground up almonds, is it counted as a nut butter tsp, or as a nuts and cheese blue container? Thanks for your help! Hi Samantha, It would be counted as a nut butter with the tsp. I am allergic to gluten and wheat products, what can I substitute for using wheat flour etc? Hi Aaliya, I use almond flour, maybe that is something to look into. I see that almond butter and peanut butter is marked “tsp in gray”. How do we count that? Hi Nancy, You measure using a teaspoon then mark as a gray container. Thank you so much for putting these out for us to learn from. I love that it’s not all about the protein. I need to write these down. The pineapple and cottage cheese was a staple when I was growing up! I am on a lot of psych drugs for depression and have gained 60 lbs due to meds. Will this diet still work for me? Okay. So then when you count the containers for a treat, do you still keep to the amount of containers you can have? I wanted to know if I was allowed a Belvita Breakfast Biscuit?? I am in my first week and I’m starving…I am highly allergic to nuts so snacks are tough for me. What would this equal?? Hi Lisa, Not listed as an approved food, I would say yellow, as they look to be some sort of grain product. Hey Lisa, I feel your pain. I’m also highly allergic to nuts, but surprisingly I’m not allergic to almonds as they are part of the peach family. Maybe look in to that too? I struggled for a long time trying to get my healthy fats in, but things like cheddar cheese (the good kind, not american cheese slices :P) are considered a blue container, so I do a lot of cheese and apples for my snacks. I’m on day 4 of my 21DF and am not a veggie eater at all. I’m struggling with the green containers. I got Kale and Romaine lettuce but you can only eat so much of that a day. Any suggestions?? Hi Missy, Romaine lettuce is actually not a 21 Day Fix approved food, romaine compared to dark leafy greens has little nutritional value. Cherry, tomatoes, carrots, celery are a few of my favorites, plus they are pretty portable. You don’t always have to do vegetables a side either, try looking for recipes that mix them in too. I stopped using dressings altogether. I find it much more satisfying to cut a small naval orange or fresh pineapple chunks into my salad. Then with every forkful I get a piece of fruit and a squirt of juice that acts as my dressing. I just got the 21 day fix today. Reading the material can you use regular salad dressings? Hi Marie, Most store bought salad dressings would not be allowed. The dressings in the book are all very tasty and easy to prepare. Hi Erin, Pretty much all vegetables are allowed. Although the Fix diet prefers you to have dark leafy greens like spinach and kale as they have a higher vitamin and nutrient content than romaine. Quick question – is there another protein powder on the shelf that equates to shakeology? Hi Ali, By quality of ingredients, none that I have found. How much beef jerky is = to 1 red? Hi Francie, It’s about 3-4 oz. Hi Doreena, You get one orange container a day. The shake is one scoop for serving. Hope that helps. I ate two slices of cheddar cheese this morning. Is it alright to count 1 as a blue and 1 as a red or 1/2 red? Hi Kris, I think so. Thank you for the snack ideas I always get in a rut. Starting the 21 day fix this week. Hi Bethany, my friend and I are going to start doing this plan. I see that organic brown rice cakes are not on the list, but since I don’t eat bread the rice cake makes a good base for my egg, slice of cheese and tomato for breakfast. Is that an okay substitute? If so, would that be considered 1 red, 1 yellow, 1/4 green? I started the 21 day fix today. So far I love the shakeology but I’m not a good eater. I tend to starve myself all day because I’m busy, but then I eat a big dinner and snack in the evening. I am trying to find healthier treats besides ice cream, etc…also, is there any way to fit in a treat of ice cream? Why does the greek yogurt have to be plain? I am a really picky eater so the fancy recipes aren’t my kind of thing. Can I use my fav salad dressing on a salad and just use the orange container to measure? When measuring pasta, do you measure it cooked or uncooked? How above when you’re eating a prepared meal like lasagna, etc…how do you count that? Sorry for all the questions? I’m excited to start but overwhelmed and keep reading the same pages over and over in my book and not finding the answers. I’m on day 4 of the 21 day fix, and I’m finding that getting all my protein is my biggest challenge, especially for snacks. I eat cottage cheese or Greek yogurt for snacks usually, but I’m getting kind of burned out on them. I eat eggs or have a smoothie with protein powder for breakfast, then have lean meats with my lunch and dinner, so it really is snacks I’m struggling with to include a protein. I’d love some new ideas. Thanks. Question: the steel cut oats and coconut shaving. Raw or cooked?!?! Thanks! Why is the 1st snack 1 purple and 1 tsp when you are using 2 tsp of PB? Does it matter if I can’t eat all of my containers? I am starting the 21 day fix on Monday and I received my pack today. Looking through the eating plan it says no carbs or fruit after 6pm. I usually do not eat until 7-7.30pm as I take my dog straight out for a walk when I get in from work. Does this mean the programme will not work if I eat these after 6pm? Sorry for asking you but you seem quite knowledgeable and as I am in the UK there is very little support in the way of coaches etc. I have food allergies and found most diets I can not follow. How do i find out what foods are approved before buying into the program. Thanks! Headed to buy groceries with this list in hand! Diet is my biggest obstacle. I am about to start with the 21 day fix and am curious if rice cakes are allowed. I sometimes need that crunch and have found that a brown rice cake with a little almond butter does the trick. Hi Jessica. I love my organic brown rice cakes, and really enjoy that extra crunch. I don’t eat bread so rice cakes are my bread. Anyway, I agree with Bethany that celery sticks are a great option, but I am still using a rice cake as 1/2 yellow from time to time. I love the balsamic glazed strawberries (1 purple container of sliced strawberries, lemon zest, and 1 tsp balsamic glaze) and the tuna salad (1 can tuna, drained and rinsed is one red container, mixed with hot sauce, celery, Dijon mustard, 1 tsp olive oil). I add the tuna salad over 1.5 green containers of romaine lettuce, diced tomato and onion. For the tuna salad add tarragon. I love your posts and look forward to putting it all into play when my 21 Day Fix packet arrives in a few days. I have gained, loss, gained more, lost more for many years and this time I plan on teaching my husband (who does most of the cooking) how to use, plan, and aid in my healthy goals. Thank you for posting … it’s encouraging. Greetings! I tried 21 day fix and only lost 5 pounds within the first cycle. I became frustrated and did not continue, I have since gained back that weight and have gotten into my bad eating habits again. I work in the nursing profession and currently work a lot of midnight shifts, which we all know are hard on the body ! I am wondering if you could share a guideline/sample menu of what would be the most beneficial for me for the days that I work my shifts. I followed and enjoyed the workouts and did notice a difference in my energy levels but I am still trying to find the healthy balance for working shift work . Thank you in advance for any recommendations. I am on a gluten free diet due to Hashimoto’s Thyroiditis which is an autoimmune disease. How would that work as far as having to use gluten free pasta, bread, etc. Is this feasible with this diet plan? I need to lose 60 lbs that I have gained since I found out I have thyroid disease. I have Hashimoto’s too! Thanks for the tip on gluten free. My doctor never mentioned it. I also have Hashimoto’s Thyroid! I’ve been Hypothyroid for like15 yes and a couple of yrs ago, the Endocrnologist took lab work and determined that I tested positive for Hashimoto’s. Was never told though to avoid wheat or anything like that. Hi Bethany. I am thinking about starting the 21 day fix also as a lot of coworkers swear by it. One thing I am wondering though is milk not allowed at all? I can’t drink coconut milk and almond or soy milk just doesn’t taste right to me on cereal, etc. Just curious how I would count it if it was allowed? Hey-Is there any suggestions on what to eat in place of whole wheat? It does a number on my stomach. I am trying to decide if I should invest in Shakeology. Does it make a huge difference in weight loss? I have a shake now that is almost the same in all ingredients. Should I just forget about a liquid protein. I really want to do this diet correctly. I have 60 pounds to loose. Please advise. I also can’t find the page you posted to keep track of me meals each day. I stumbled on it last night but cannot find it again. I have the sample meal plan, shopping list, snack ideas but not the tally sheet to keep track of how many containers I need each day. Thank you in advance! Are these snacks an addition to the meal plan or is it to be used in the meal plan? I tend to want to snack late at night, and this has been a big problem for me. They usually leave me feeling bloated, and guilty. However, I tried the almond butter and strawberry slices over a honey wheat sandwich round and it was very good. Killed the sweet craving, without leaving me feeling overly full…..and no guilt!! Hi Jessica, I also use sandwich rounds. But what is considered 1 yellow, half or both halves? Is there any chocolate snacks I’m new to this and I’m having a hard time with my chocolate cravings.. This might seem like a silly question, but im new to the 21 Day Fix. When it comes to pasta, I know it says to eat whole wheat, but can you eat whole grain pasta instead? What about the veggie pasta that is made from carrot and tomato purée? It’s not on the the 21 Day Fix eating plan, but that is not to say there is anything wrong with it. Hi Lori, I would go by the book when starting out. This website is super helpful. I really like the sample meal plan you provided. Thank you for all the resources. I have Shakeology and I will admit that it does reduce my cravings. I know not everyone can afford it but for me I use it replace a meal. (And I am not a coach). I decided to cut out my 3 times a week latte habit to have enough money. Now I drink coffee at home and drink Shakeology. Are there serving sizes available for your listed snacks? ex:nuts,oats, pineapple? Thank you. i just found your blog and I find it very helpful. Thank you. You’re welcome, Melissa! The serving size on the package should be fine, that would not be exact, but it would be similar to the portion control servings. Love these recipes, will try 7 of them for my next week which is my 3rd in the 21 day fix, I can tell the program works, I have a full time job plus I study and have only walked on weekends as my exercise and I have lost 4lbs per week!!! Lovin it!!! 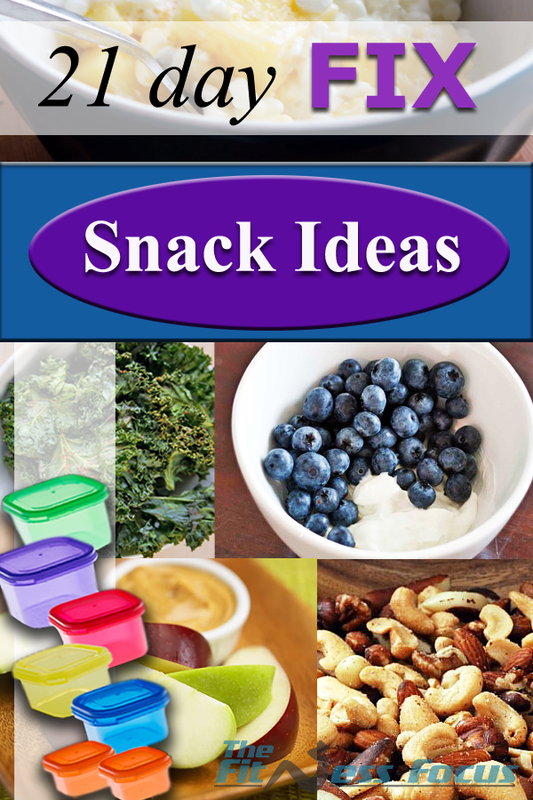 Great snack ideas! I love your printables. Many thanks! Keep up the great ideas! What kind of beef jerky do you get that doesn’t thaven’t a ton on sodium? I usually do Oberto All Natural jerky which does not contain artificial ingredients or msg. This is a terrific list and I eat many of these same snacks too. Another thing I like to make is a simple pudding from chia seeds soaked in almond milk. Super easy & yummy!